Fabric Stitched self expanding document case..
Name card Pocket for easy identification.. 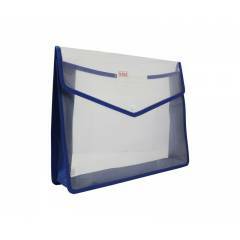 Suitable for storing important documents, papers, notes, bills, receipts and other such things safely.. Available in vibrant transparent colors..
Saya Natural Flexi Document Clear Bag Eco, Dimensions: 365 x 285 x 80 mm (Pack of 4) is a premium quality Document Bags from Saya. Moglix is a well-known ecommerce platform for qualitative range of Document Bags. All Saya Natural Flexi Document Clear Bag Eco, Dimensions: 365 x 285 x 80 mm (Pack of 4) are manufactured by using quality assured material and advanced techniques, which make them up to the standard in this highly challenging field. The materials utilized to manufacture Saya Natural Flexi Document Clear Bag Eco, Dimensions: 365 x 285 x 80 mm (Pack of 4), are sourced from the most reliable and official Document Bags vendors, chosen after performing detailed market surveys. Thus, Saya products are widely acknowledged in the market for their high quality. We are dedicatedly involved in providing an excellent quality array of Saya Document Bags.